He wasn’t at his best, but Buckeyes recruit Cole Niekamp found a way Tuesday, while his teammates found plenty of offense…to put Parkway on ice. Versailles – It was cold, of course, on Tuesday. Miserable for baseball. Those in charge can be proud, while they cling to the tradition, of playing in 38 degree temperatures – on a ‘warmer than usual, so far’ April afternoon. 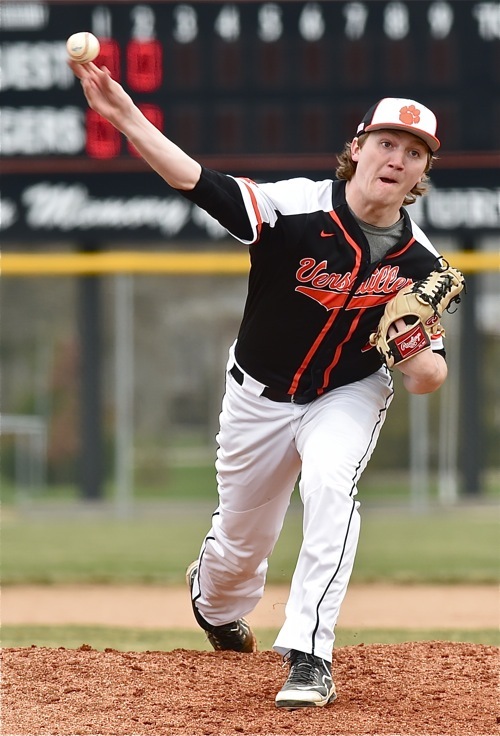 But Versailles senior Cole Niekamp – aka ‘Smoke’ for that heavy, sinking fastball that he throws – took it as a challenge, and opportunity, to show that even against the elements he was willing to compete and find a way to win. And that’s what he did Tuesday afternoon, pitching 6.1 innings of 3 run, 4-hit baseball, to heap the misery of another cold, damp day on the Parkway Panthers, 9-3. Niekamp, who’s been called ‘Smoke’ by teammates and friends for as long as most can remember, earned that moniker for his ability to throw a baseball, and throw it hard. Of course there are varying degrees of hard; and some throw it harder than ‘Smoke’. But his kind of hard includes movement, a boring fastball that eats up right-handed hitters, and a rapidly developing curveball that sets them back on their heels when they take the fastball for granted. He started out well enough, Tuesday, retiring six of the first seven batters he faced, striking out two. But then in the third…he made some mistakes, elevated the fastball, and Parkway, a good hitting team, strung together three successive singles to load the bases. And a passed ball by Versailles catcher Kurt Rutschilling allowed center fielder Corey Walls to score from third with the game’s first run. Niekamp recovered, and would go on to pitch a scoreless fourth, fifth, and sixth, mixing in the breaking pitch while struggling to find a feel, and consistency, for what he was doing. If you’re never tried it…it’s not easy to pitch in 38-degree temperature. Niekamp gave up three runs on four hits, and struck out five in 6-plus innings. In the meantime he got all the offensive support he needed. The Tigers answered Parkway’s run in the top of the third with two of their own in the bottom of the inning. They then scored four more in the fourth, three more in the sixth, and it appeared over and done. But Parkway proved pesky, and opened the seventh with a walk, a fielder’s choice, and a pair of hits off Niekamp…and his night was done. Noah Richard was summoned by (Coach) Ryan Schlater from left field to get the final two outs, but that wasn’t easy, either. He walked successive hitters, forcing in a run, before inducing first baseman Noah Riley to hit into a game-ending short-to second-to first double play. 9 runs on 14 hits and 2 errors won it for Versailles; while 3 runs on just 4 hits and 4 errors lost it for Parkway. The Tigers, struggling to play in the arctic freeze, like everyone else, improved to 5-0 on the season. The hitting stars? 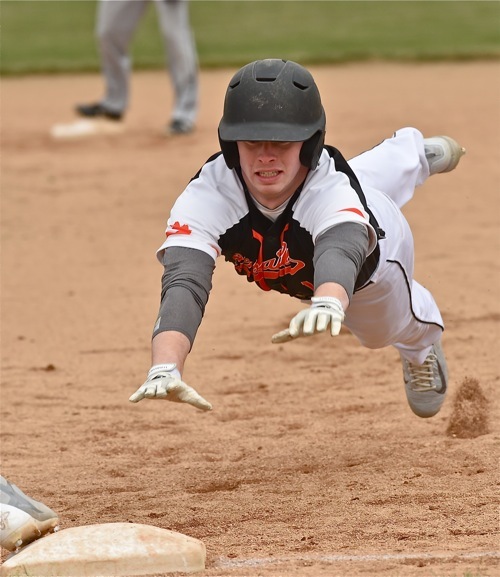 Keaton McEldowney and Kurt Rutschilling each had three hits for Versailles; and Ruschilling had three runs batted in. But the scoreboard showed…just about everyone in the lineup got their hacks. He wasn’t happy about not finishing what he started, firing his glove against the dugout wall in frustration when he left the mound; but afterwards ‘Smoke’ Niekamp was content with a good win for his team, and dealt with the reality that it’s really hard to play baseball – pitch – in freezing temperatures. He finished with five strikeouts, four walks, a hit batter, and gave up those four hits. Kurt Rutschilling line single drives in a teammate (background) in the Tigers’ three-run sixth. 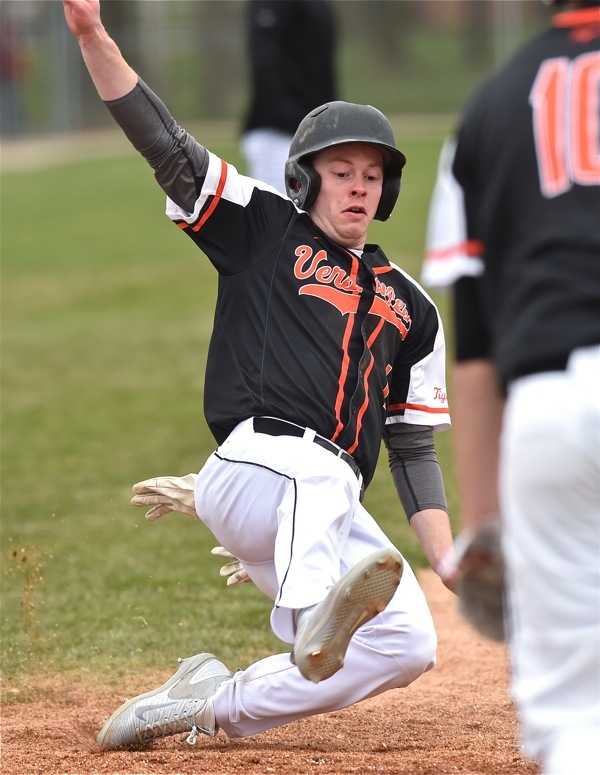 The fact that Versailles won on a day when they got a competitive, a good but not great, effort from Niekamp on the mound, was a message to future opponents. There will be days when it’s not cold, when he has a better feel for the strike zone…and their lineup is more than capable of supporting him. But they, like everyone else, need to play! “We’re not there yet, but so far we’re swinging the bats OK. Yesterday we had 15 hits against Celina, and tonight we had almost that many. Cole didn’t have great location, but with the weather being cold it’s not easy. It’s hard to play. And it seems like it’s been that way every time we’ve played. But you’ve got deal with it. The thing is, he was able to do that today, and I’m sure he’ll have to do that next year (at OSU). Keaton McEldowney hustles to get back to first before being doubled off in the first. He didn’t make it! 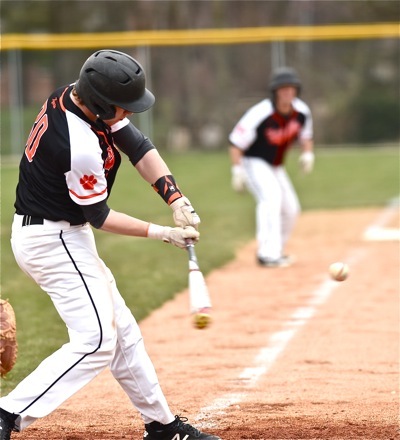 They’ll read this, of course, around the baseball-tough MAC, which promises to be another day-by-day fight between the presumptive favorites – Minster, Versailles, Fort Recovery, and Coldwater. And if you like your high school baseball with an order of ‘heat’ on the side, that game next Tuesday should be to anyone’s liking. Fort Recovery will undoubtedly throw senior fire-baller Nick Thwaits. And of course, Versailles will counter with some ‘Smoke’ of their own. 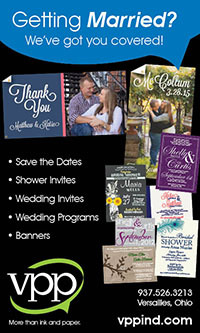 It’s going to get better – the weather and the baseball – so they all say. All they need to do…is play!